The Bubble Umbrella – When people stare at you weirdly while walking down the street carrying one of these, it is possible that they think you’ve taken the term “personal bubble” a little too seriously. Avoid staring at people through the transparency of the sides of your umbrella to decrease the likelihood of awkward moments. The Oversized Umbrella – You are basically asking for it if random strangers who are also waiting to cross the street end up temporarily standing under your means of dryness, so don’t be freaked out. Either your mother made you take the family umbrella to college, or you actually don’t mind carrying the umbrella for other people. Since the latter is unlikely, we say such rain gear is not actually rain gear at all, but better saved for a sunny day on a warm patio or dug into some hot sand in the summer for some good ol’ fashioned man-made shade. The Compact Umbrella – On the contrary, you hate carrying umbrellas for other people (get your own!) and passive-aggressively convey this by whipping out the petit and anti-social size, insisting that you got it for convenience (“look! it fits in my bag where the water bottle should go!”). If people insist on sharing, make them carry it for you (that usually does the trick). The Cheap but Useless Umbrella – Coming from a hometown way south of the Bay Area entails a lot of things, including a lack of experience with precipitation. You bought this umbrella at a drug store on the way to class (only 99 cents! ), while already half drenched and miserable. To make matters worse, your last-minute purchase cannot withstand the windy spells of a rainstorm and (just like in the movies) it turns inside-out on your way to class. People around you stare, and some even snicker as you stand there, mortified and unsure how to mangle the metal back into its original form. And now you’re even more soaked. Avoid being this person and invest in a loyal means of rain protection. 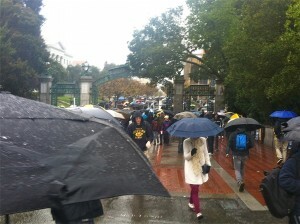 The Cal Umbrella – Could blue and gold ever get old? We’ll leave that one up to you. But for a limited time, collegiate rain gear can be found strategically placed near the entrance of the Cal Student Store (from the lower Sproul entrance) for your added convenience. The Hood – So you’re too cool for an umbrella. And while you do feel invincible walking down Sproul laughing at the rain droplets on your waterproof jacket, impermeable to the Gore-tex of your North Face, think again. The poor contents of your backpack may be suffering due to your pride … Unless you’re a bonafide rain survivor and write all of your notes in Sharpie AND your laptop is magically waterproof. If you answered yes to the last statement, then by all means, rebel! Happy singin’ in the rain! I don’t see myself sporting this combination anytime soon, but I really like it! I’ve always been a sucker for uncommon and “forbidden” color combinations. The red and pink sure is a fresh combination. I would break out in a smile if I spotted anyone wearing it in this dark and cold weather. This is a comment to the webmaster. I came to your “The Daily Clog » Rainy days reveal all” page via Google but it was difficult to find as you were not on the front page of search results. I see you could have more visitors because there are not many comments on your site yet. I have found a website which offers to dramatically increase your rankings and traffic to your site: http://aerotraffic.com/web-traffic/. I managed to get close to 1000 visitors/day using their services, you could also get lot more targeted traffic than you have now. I used their services and got significantly more visitors to my website. Hope this helps Take care.